One of the jihadists who committed the latest terrorist attack in London — in which men slammed a van into a crowd of people, and then emerged to slash and stab random people who just happened to be present — was known to and under investigation by British police at the time of the attack. ISIS has since claimed that the attackers were members of that terrorist group. The London attack is one of several recent “known wolf” incidents, in which an individual with apparently radicalized jihadist views who was under some form of police investigation then proceeded to commit a terrorist act. The scenario raises a number of difficult questions for police — and for western societies. Great Britain reportedly has identified thousands of people who are considered to be potential threats. What should be done with them? What level of concern must be reached before someone with apparently extremist views receives more active attention, like significant surveillance efforts? How should governments react to anonymous tips from neighbors? And if police determine someone is a significant potential threat, should they be jailed? Deported? And what level of evidence should be shown before such penalties can be imposed? If we wait until the threat level becomes critical, are we running too great a risk? Everyone wants to promote security, but it’s also easy to see how a desire for security could overwhelm and undercut the personal freedoms and civil rights that we enjoy in open western societies. That is no doubt small consolation, however, to the relatives of the people who were killed in the London attack by a man whose extremist views caused him to be featured in “The Jihadis Next Door.” We’ve got to figure out how to deal with the radicalized people in a way that respects our civil institutions, religious rights, and presumptions of innocence while also more effectively preventing more mass attacks. We’re living in the midst of the leakiest America in history, and it’s causing lots of problems for our country. The leakiness isn’t confined to just Washington, D.C., the Democratic National Committee, or the confused conduct of the Trump White House, where it seems as though every confidential meeting must end with a dash to the door so that everyone in attendance can call their favorite journalist and recount what just happened in excruciating detail. Now the leak-fest is also affecting foreign affairs and criminal investigations, too. The latest evidence of this problem involves the investigation into the horrendous suicide bombing in Manchester, England, where an Islamic extremist specifically targeted kids and their parents at a concert and killed 22 innocents and injured 64 more. British authorities shared information about the attack, including the name of the bomber and photos of the debris being examined as part of the investigation, with an intelligence network that includes the United States. Some unprincipled American recipient of the information then promptly leaked the information to the New York Times, which published it. The BBC is reporting that British officials are furious about the leaks, which could affect the success of their investigation, and have stopped sharing intelligence about the attack and its investigation with American authorities. British Prime Minister Theresa May also plans to raise the issue with President Trump at this week’s NATO meeting. Of course, it’s not clear that Trump has any ability to stop the rampant leakiness — he can’t even get his own White House personnel to keep things confidential. When the profound leakiness in our government invades the intelligence agencies and the criminal investigators, to the point that our allies can’t even trust us sufficiently to disclose information about terrorist attacks that are bedeviling all western countries, then we’ve got serious problems. Obviously, we want to get whatever information we can about terrorist attacks, so we can use the information to prepare our own defenses and procedures to try to prevent future attacks. If our allies withhold information because they’re afraid it will be leaked, that not only embarrasses America, it hurts us, too. And if criminal investigators become as leaky as White House staffers, the confidential investigatory information they provide may help the criminal actor to avoid capture or prevent a fair trial — neither of which is a good thing, either. The reality is that some things must be kept secret, and if the people in our government can’t keep their mouths shut about the truly secret stuff, then they aren’t qualified to serve in positions where the ability to maintain confidences is a crucial part of the job. We need to determine who is leaking intelligence and investigatory information and thereby imperiling both our relationships with our allies and our own security and replace them. The leaks have got to stop. Yesterday’s brutal terrorist attack in London, England — in which a terrorist drove a car into innocent people walking on the Westminster Bridge near the Houses of Parliament, then jumped out of the car armed with knives and stabbed and killed a police officer before being shot by police — is just the latest terrorist attack in which the principal deadly weapon has been an automobile. Not a car filled with explosives and fitted out to be a bomb — just an everyday car that becomes weaponized because it is driven by a fanatic who thinks that plowing into random people, leaving some dead and others grievously injured, somehow advances their twisted agenda. Yesterday the everyday car that was turned into an instrument of evil was a grey Hyundai sedan. How many grey Hyundai sedans do you see every day in your town? Security experts call it “low-tech terror,” in which terrorists use common devices like cars and turn them into weapons capable of mass murder. Terrorist attacks involving vehicles have happened elsewhere in Europe, but don’t think you can protect yourself simply by avoiding places like London, Berlin, Milan, or Nice, where those attacks have occurred — the terrorist attack on the Ohio State University campus, here in our heartland town of Columbus, Ohio, involved a car intentionally driven into a crowd that was created by the driver pulling a fire alarm that caused people to leave a building and congregate outside, where they became an inviting target. So how do you protect yourself from an attack when any car that you see during your day conceivably could have become weaponized by a nut behind the wheel? Security experts say you should exercise extra caution when you do anything that brings you into close proximity to lots of other people, like going to a baseball game or a concert or a busy shopping area. 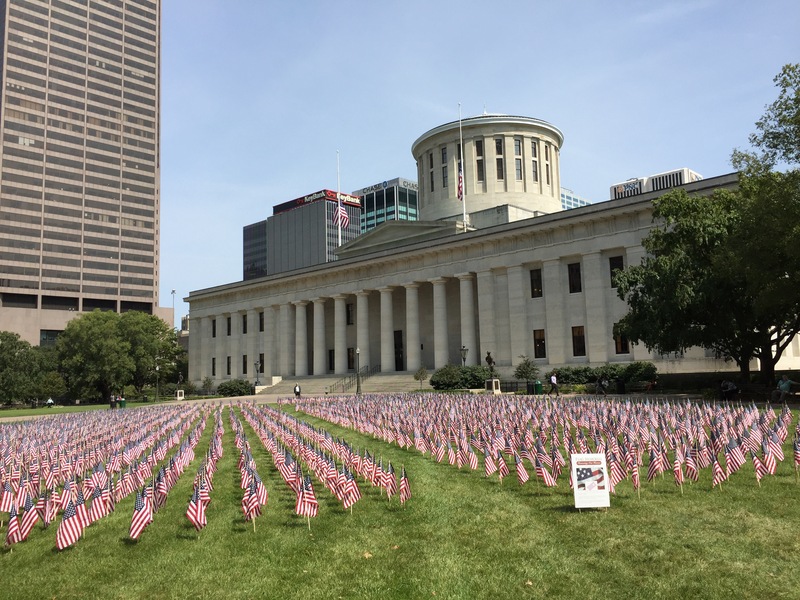 Of course, the Ohio State attack did not involve any of those things — so perhaps we all need to keep our eyes open during the next fire drill, or when noon rolls around and workers leave their buildings to go somewhere for lunch, or family members gather for a high school graduation ceremony, or any of the other countless occasions that cause Americans to gather together. It’s a new frontier in terror, and we’re just going to have to pay more attention when we’re out and about. But I’m not going to avoid football games or musical performances or other events where people congregate just because some disturbed lunatic might drive a car into the people who are there, any more than I avoided such events because there was a chance that a nut in an explosive vest might be there, too. The terrorists aren’t going to beat us or cow us into submission that easily. It was a tough morning in Columbus yesterday. When word spread that there was an active shooter somewhere on the Ohio State campus, everyone in town started thinking about people they know who attend the University, or work there, or might conceivably be down in the campus area. Because Ohio State is a huge, integral part of the Columbus community, a violent incident on campus could affect a lot of people, students and non-students alike. We held our breath and hoped. As the day wore on, the story changed. The active shooter became an Ohio State student who apparently pulled a fire alarm at the OSU engineering buildings and labs, then drove his car into the crowd of students and faculty who had exited the buildings in response to the alarm. After his car hit the crowd, the driver emerged armed with a butcher’s knife and began slashing and stabbing people. Students broke and ran. Fortunately, an Ohio State campus police officer happened to be nearby, and he shot and killed the assailant — a student named Abdul Razak Ali Artan — before he was able to injure anyone else. Eleven innocent people were hurt in the car crash and stabbings, but all are expected to survive. You can read the AP story about the incident here and the Columbus Dispatch story here. Was it an act of terrorism? Authorities are investigating whether Artan became self-radicalized somehow, and was responding to calls from terrorist groups, like ISIS, encouraging members to engage in car attacks and knife attacks against westerners. According to witnesses, Artan wasn’t speaking when he emerged from the car and started his slashing attacks. We’ll have to wait for authorities to piece together his back story from the evidence they gather, and while the investigation proceeds our city will hold its breath a second time. That’s because Artan apparently was of Somali descent, and Columbus has a large Somali community — and when something like this happens, there are inevitable fears of a backlash. Having lived in Columbus for decades, I don’t think that’s going to happen, but people will be walking on eggshells for a while. Whether Artan’s attack is officially found to be an act of terrorism, or just the violent attack of someone who became deranged, for a brief period yesterday there was terror on the Ohio State campus. Students were put in danger, their parents tried frantically to find out whether their children were OK, and our community had to deal with another of the distressingly frequent acts of random violence. Officials say that Ahmad Khan Rahami, the suspect in the New York City dumpster bombing that occurred on Saturday night, was captured in part because of an array of security cameras. Several cameras took footage of Rahami lurking near the site of the bombings, and the photos and a license plate reader allowed officials to track and eventually apprehend Rahami. As part of the process, authorities also sent out an alert to NYC cell phone users identifying Rahami as the suspect and asking for help in finding and capturing him. The security cameras that took pictures of Rahami are part of a system of 8,000 cameras in Manhattan. Officials call it the “Ring of Steel.” Footage from the cameras, which are both government and private owned, is fed into the Lower Manhattan Security Coordination Center, where it is monitored by police. And the camera system apparently will only grow more extensive — New York is considering installing cameras in every street light, too. There also are more than 200 license plate readers in New York City that can triangulate information with GPS systems to allow help officials track and capture suspect vehicles. Other technology weapons deployed in the fight against terrorism in NYC include biological, chemical, and radiation sensors, “shot monitors” that detect gunfire, a system that collects alerts on suspicious packages or persons, and computer systems that analyze and organize the mass of information being received. 8,000 cameras already, and more on the way. Real-time video feeds. License plate readers. Cell phone alerts. Countless monitors. GPS systems. Vast computer data storage and analytic programs. It’s the 21st century, folks, and we’ve got the high-tech law enforcement technology to prove it. And don’t forget, too, that everyone you encounter on the streets has a device in their purse or pocket that will allow them to take a picture or video of anything interesting, too. New York City must be the most photographed, monitored, analyzed place on Earth. People who are concerned about the erosion of privacy — like me — can bemoan a future where innocent people are being routinely photographed, videotaped, and monitored by law enforcement as they go about their affairs, but whether we like it or not it’s the reality of the modern, terrorist-fighting world. This time, the systems worked.